Notice this critical passage regarding America and Britain: “And he [Jacob, renamed Israel] blessed Joseph, and said, God, before whom my fathers Abraham and Isaac did walk, … bless the lads; and let my name be named on them … and let them grow into a multitude in the midst of the earth” (Genesis 48:15-16). As The United States and Britain in Prophecy proves, God answered this prayer. Manasseh and Ephraim did grow into a multitude. In fact, as God promised in Genesis 35:11, they became “a nation and a company of nations”—Manasseh a single “great” nation, and Ephraim “a multitude of nations” (see also Genesis 48:19). And the name “Israel” was named on these nations. They are the birthright nations, blessed above all others on Earth. How specific are these prophecies about the nations of Israel! Your Bible says Reuben’s modern descendants will again betray the latter-day descendants of Joseph—America and Britain! If you don’t know the modern identity of the sons of Jacob, you cannot understand Bible prophecy! And one third of the Bible is devoted to prophecy. And what will Europeans do with that army? Macron explicitly said it was needed to protect Europe “with respect to China, Russia and even the United States.”Does that sound like a stable brotherhood, like the one in World Wars i and ii? Brig. Gen. (Ret.) Anthony J. Tata wrote about those comments: “Macron could not have levied a greater insult at America and its veterans on this 100th anniversary of the armistice signed between the Allies and Germany on the 11th hour of the 11th day of the 11th month in 1918 to end World War i and, ironically, save Europe” (Fox News, Nov. 10, 2018). It’s as if Macron was spitting on the graves of those men! Macron wants to push America out of Europe! The way he views it, France and Europe don’t need America anymore! President Macron’s remarks about the need to create a European military triggered the highest-level discussion of a European army yet to take place in postwar Europe. “The idea of a European army is now on everyone’s lips,” wrote the EU Observer (Nov. 14, 2018). Just days after Macron’s remarks, German Chancellor Angela Merkel supported his call, saying that “we have to work on a vision of one day creating a real, true European army.” The top candidates to succeed Merkel as German chancellor have also made similar comments. This is a stunning development—but it is one that we have been expecting for many decades! French Finance Minister Bruno Le Maire took things even further. He said the European Union must become a “form of empire, like China, and the U.S.” “I use the term [empire] to sharpen awareness that we are going into a world where power matters. Europe should no longer shrink from deploying its power,” he said. Europe’s leaders are talking more about Charlemagne, who led the First Reich in A.D.800. They aren’t yet discussing Adolf Hitler openly, but he was part of the same thread of history! He worshiped Charlemagne. He labeled his empire the Third Reich—a resurrection of Charlemagne’s First Reich, which was the Holy Roman Empire. Both of these violent rulers waded through blood in pursuit of their crazed ambitions. Anyone can read the truth in history books—but few know much about it! People aren’t concerned that the tradition of Charlemagne is being openly promoted in Austria and Germany today, but they should be! That tradition has a bloody, bloody history! Austrian Chancellor Sebastian Kurz says that he will rule his nation in accordance with the Catholic Church. If you understand history, you know that is exactly what the Holy Roman Empire is! You are going to see that old empire increasingly take center stage. Mr. Armstrong long prophesied that Britain would not be part of the new united Europe. But using the Bible as his guide, he believed France would be in this final resurrection of the Holy Roman Empire. God prophesied of seven heads, or resurrections, of that evil empire. Six have come and gone, and now the seventh is bursting onto the scene. It is going to wreak the most suffering this world has ever seen! Its exploits will make World War ii look like a minor rehearsal. Germany has started two world wars. Brace yourself, because it is about to start a third! That is the truth revealed in Bible prophecy. If you don’t believe that, then just keep your eyes on the news because you’re about to see it happen—and soon! In a few short years, we will see all these prophecies come to fruition. The coming of the Messiah, the greatest event ever, will happen in six to 10 years, as I calculate it. That means the time of Jacob’s Trouble, the worst suffering this Earth has ever experienced, will start within a few short years (Daniel 12:1; Jeremiah 30:7). You need to understand the spirit behind France’s behavior, and behind the remarks of President Macron and Chancellor Merkel. This terrifying spirit is going to change your life like nothing ever has—unless God protects you. I have a responsibility to proclaim this message and expose the Holy Roman Empire for what it is. People scoff at Bible prophecy. But they won’t scoff for long. Macron’s recent remarks echo what high European officials are already thinking and discussing. They want a Holy Roman Empire army that can stand up to any enemy. The empire is already there. They are just waiting for the prophesied strongman to lead it (Daniel 8:23). Perhaps President Macron thinks he will play the role of this much-needed strongman. If so, he is dreaming! There is no way this man will be the leader of the Holy Roman Empire. His nation will be a part of that empire, however—a secondary, inferior part. And by doing so, France will betray America and Britain, as Reuben did anciently. Macron’s remarks in November were laced with a spirit of betrayal. And they were consistent with what we have prophesied for over 80 years! Herbert Armstrong was right. Britain is on the way out of the beast power. But France is definitely in! They want a Holy Roman Empire army that can stand up to any enemy. The empire is already there. They are just waiting for the prophesied strongman to lead it. A strongman is ready to come on the scene. People are pushing German Chancellor Angela Merkel out. Who will replace her? Every leader in Europe would like to have that job. But only one will get it. And we believe we know who he is. “O Assyrian, the rod of mine anger, and the staff in their hand is mine indignation” (Isaiah 10:5). The modern-day counterpart of Assyria is Germany. God is going to use Germany to correct the nations of Israel. Why? Because He is wrathful with these nations because of their sins. Rather than thank God for the birthright blessings, Israel takes credit for creating those blessings and all that wealth itself. But those blessings are disappearing fast. Just look at what is happening in America: wildfires in the west, floods in the east, mass shootings, protests, division, hatred. Just 10 years ago you wouldn’t even recognize what the radical left is doing today throughout society. America is on course to collapse—at lightning speed—just as God prophesied. Thankfully, every bit of what is happening is leading directly to the Coming of the Messiah! Bible prophecy makes this abundantly clear! Mankind has never been more capable of utterly destroying itself than right now. Yet so many leaders and heads of government act like they can solve these problems. That is delusional! Only God can solve this. Yet they refuse to turn to God. What about you? We must stand up and speak for God. If you come out of this world today, God says, then He will protect you physically and give you the highest honor forever. God wants to make you part of His royal Family. He is offering a group of people today the opportunity to be the Bride and share His throne with Him for all eternity as kings and priests (Isaiah 56:5). That is an unparalleled reward! 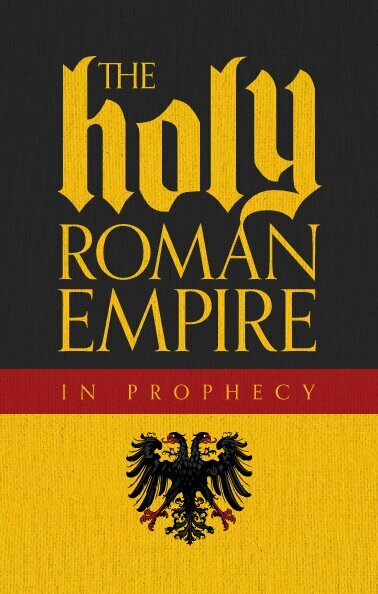 Order your free copy of The Holy Roman Empire in Prophecy or read online. The Holy Roman Empire has made pivotal and defining contributions to Western civilization—but its many reincarnations have also come with painful and catastrophic consequences. European leaders aim to unite the fractured continent of Europe by reviving the legacy of this extraordinary church-state combine. One of the great lessons of this empire is that it always comes back. There is always another resurrection. The Holy Roman Empire is not just a relic of history. It is about to play a central role in world events. Coming to understand about the nature and character of this powerful institution tells you as much about the future as it does about the past.